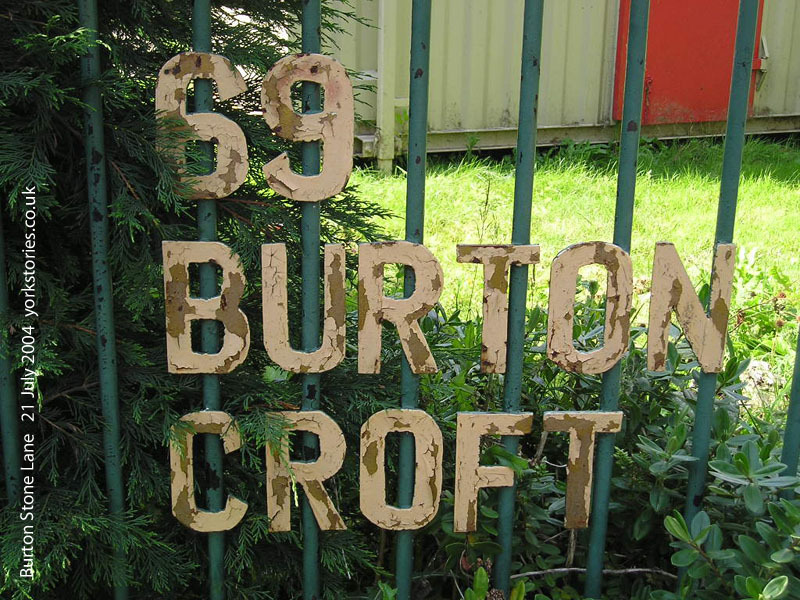 Peeling paint on the sign for Burton Croft, on Burton Stone Lane, in summer 2004. Burton Croft was the former home of J B Morrell, and in its later years a nursing home. 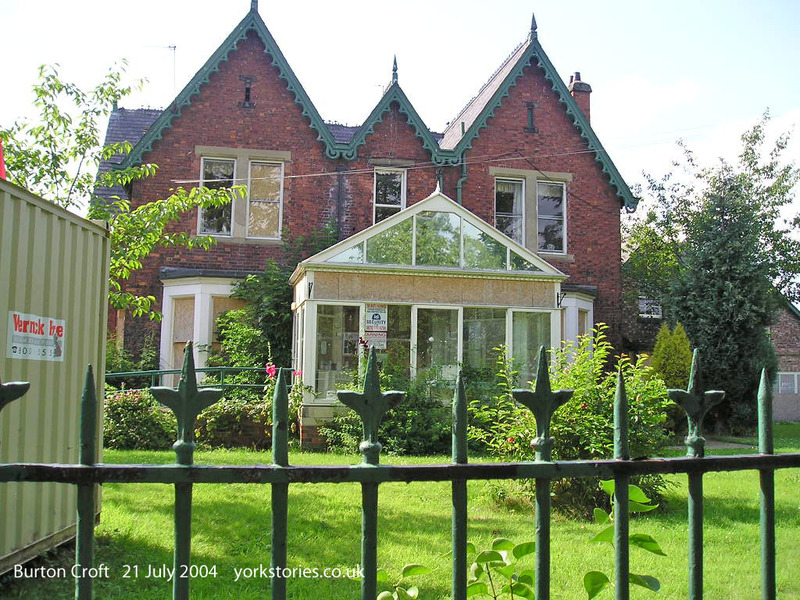 After this closed the house was under threat of demolition, with plans to redevelop the site. A campaign followed, and the site was also occupied for a time by a collective highlighting the number of empty buildings in the city. Campaigns failed and the building was demolished. Its replacement is pictured above, this year. I noticed that a section of green railing from the original Burton Croft has been retained on its front boundary. The site keeps its name, now carved in stone rather than shaped in metal. The boundary for a time also displayed a plaque commemorating the life and work of J B Morrell, but this has been removed/stolen in the intervening years. Over on the other side of town, another of these aesthetically pleasing signage and railing combinations. Well, I found it aesthetically pleasing, lit by summer sunshine. Actually it’s gates rather than railing. 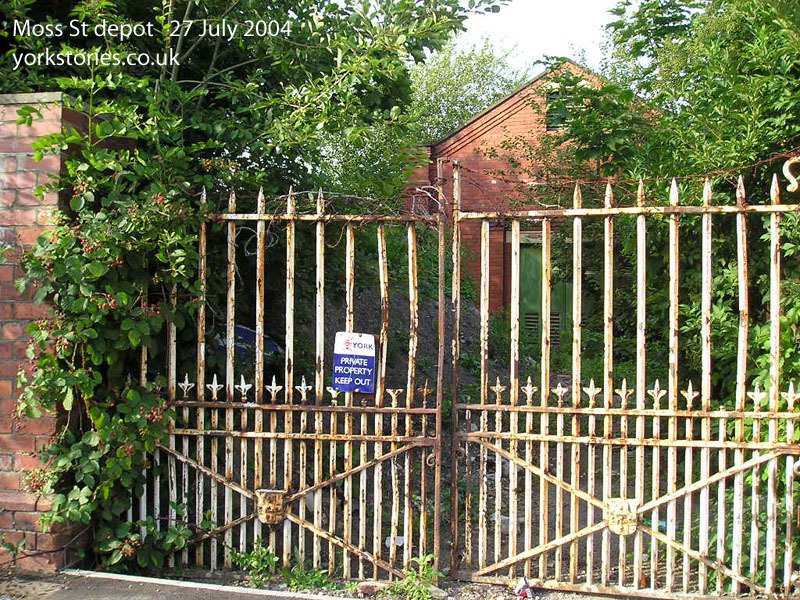 The gates to the old Moss St depot, near Scarcroft School, in July 2004. 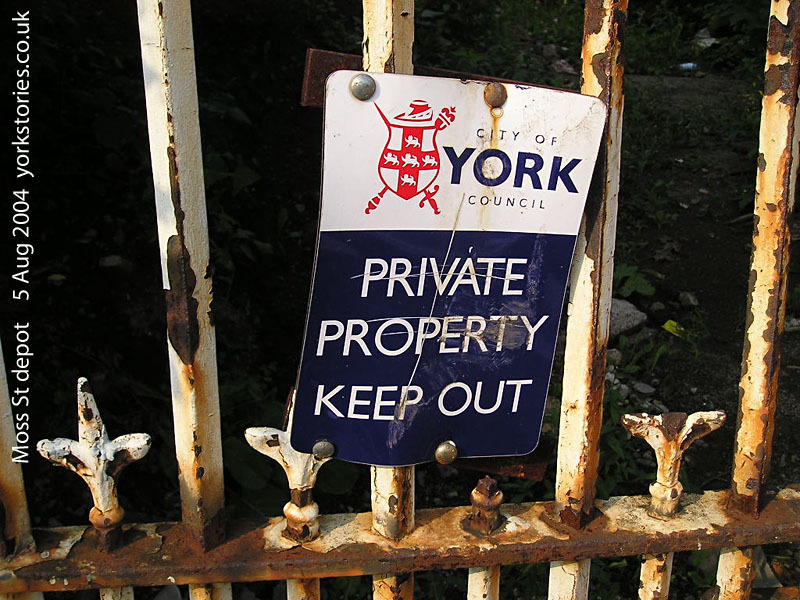 I’m not sure what used to happen here, but in recognition of its former role as a City of York Council property its gates incorporated the city arms, as many buildings and structures in the city still do. (See Hugh Murray’s book on heraldry in the city of York.) Perhaps they were painted in colour at one time and looked smart. Clearly by the time I took this photo they hadn’t been painted for some years. By early September demolition had begun on the site. 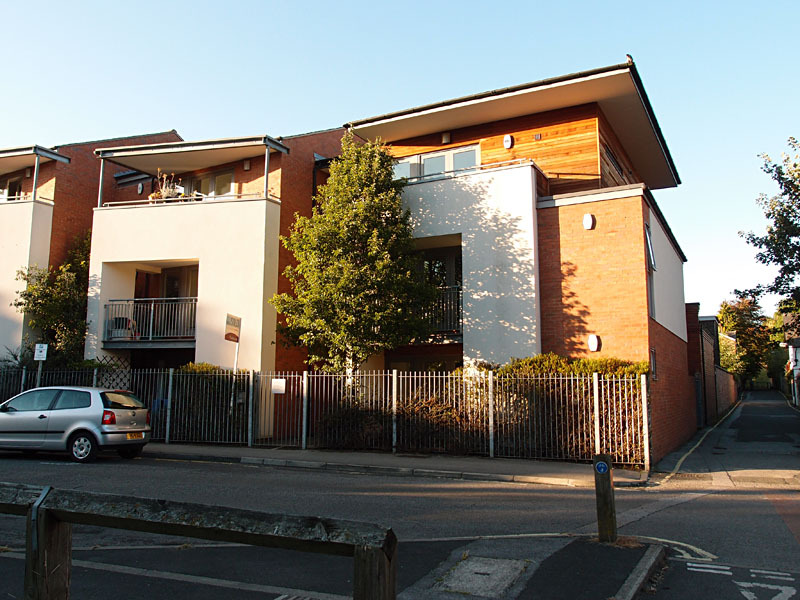 Ten years on, 31 August 2014, showing the housing built on the site of the Moss St depot. Back to 2004, and another old sign. 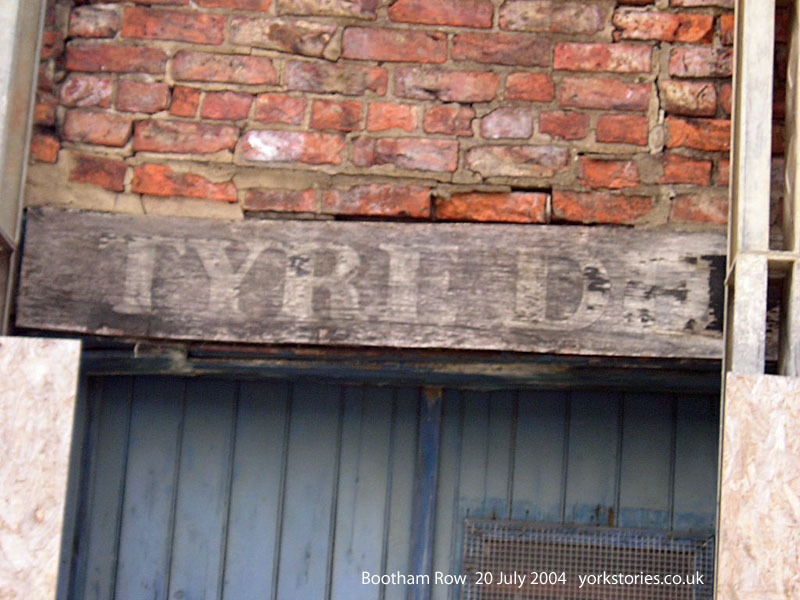 A bit blurred, but a reminder of the old garage buildings here on Bootham Row. It denoted the entrance to the ‘tyre depot’. 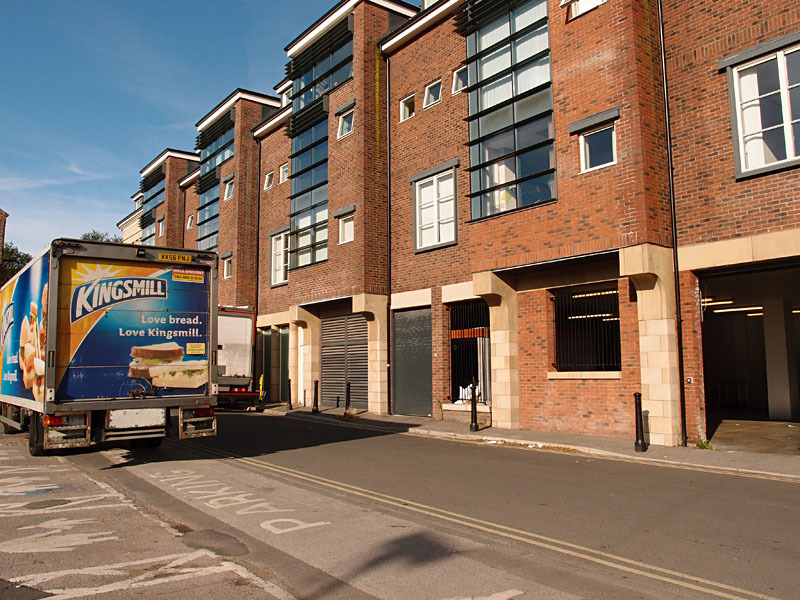 The tyre depot was part of this collection of buildings, pleasing old red brick, one with a nicely rounded corner. 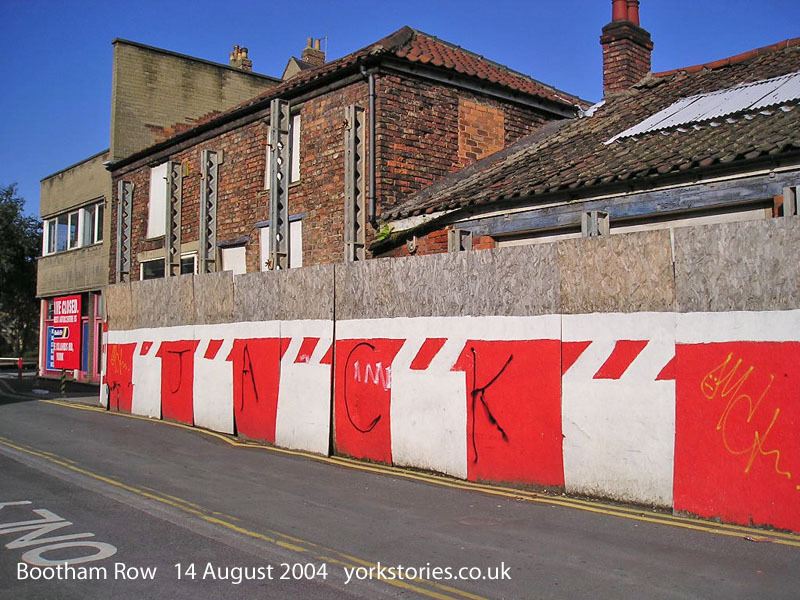 Here pictured from Bootham Row, which is now a car park but used to be a street of terraced houses. At its corner, where it meets Bootham, you can see part of a more modern building, once a smart garage forecourt (pictured on this earlier page) where you could buy petrol. By 2004 all rather redundant, and ripe for redevelopment. Here’s its replacement, pictured from the same car park vantage point, ten years later. The ground floor frontage onto Bootham where the garage forecourt used to be is now a Sainsbury’s Local, with service areas and garaging behind it, and apartments and offices above. Only one of these three developments was seen as controversial, as far as I’m aware. The buildings on Bootham Row and Moss St weren’t celebrated or mourned, but J B Morrell’s former home clearly was. 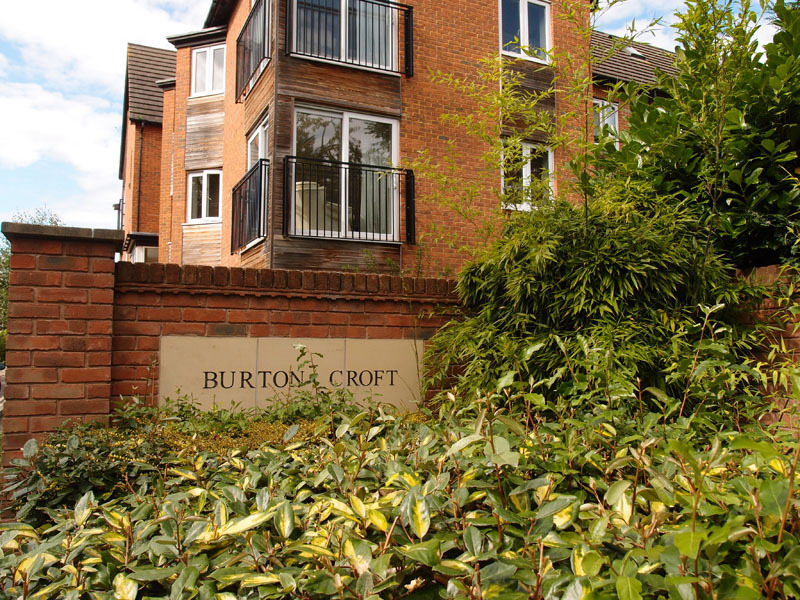 In itself, as it looked in 2004, I didn’t find Burton Croft particularly notable, architecturally. It seemed, from the outside anyway, far less attractive than the Burnholme club building, another substantial Victorian house which apparently wasn’t worth saving either. The housing built on the site to replace it is far more attractive than many other apartment developments I’ve seen in the last decade. 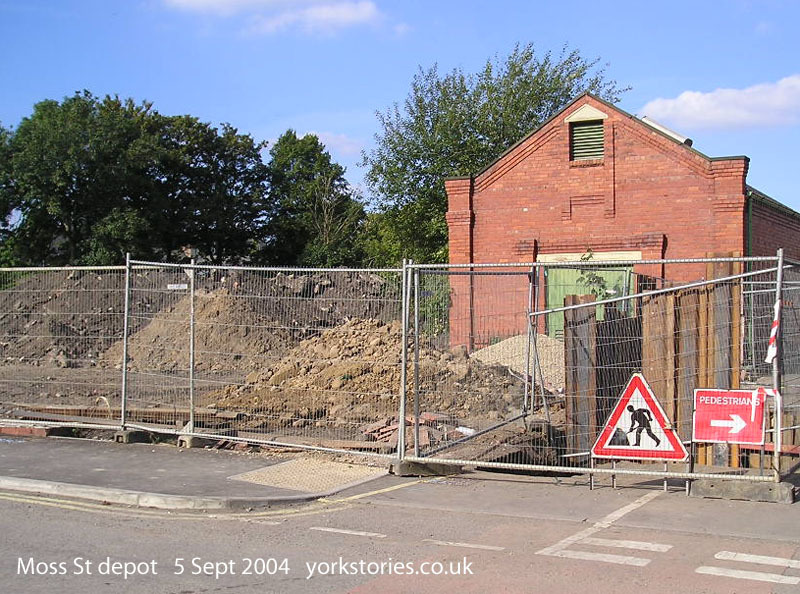 The Bootham Row buildings that were demolished perhaps were not particularly special. But the new flats aren’t, either – and their rear elevation, seen from Bootham School, looks like a prison. And it blocks the view of the Minster…hey ho. Why don’t people just build more interesting buildings? I’ve noticed an interesting building is visible from the same Bootham Row car park, with what looks like a green roof of some kind, and I think it must be in the grounds of Bootham School. And I’m sorry to hear that the school’s view outwards has been blighted, something I think is increasingly common as we replace low ‘human scale’ buildings with massively tall ones. The same is no doubt going to happen in Piccadilly when the various old garage buildings there are replaced by huge light-blocking developments.